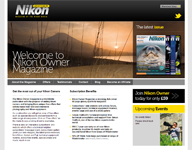 London, UK, 10 February 2015 Nikon today announces the D810A, the first FX-format D-SLR engineered for astrophotography. 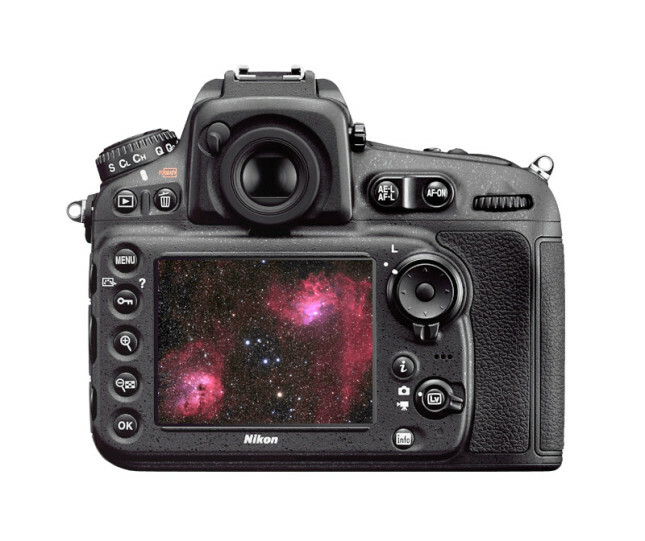 With a host of specialised functions, this camera captures magnificent 36.3-megapixel images of the cosmos. 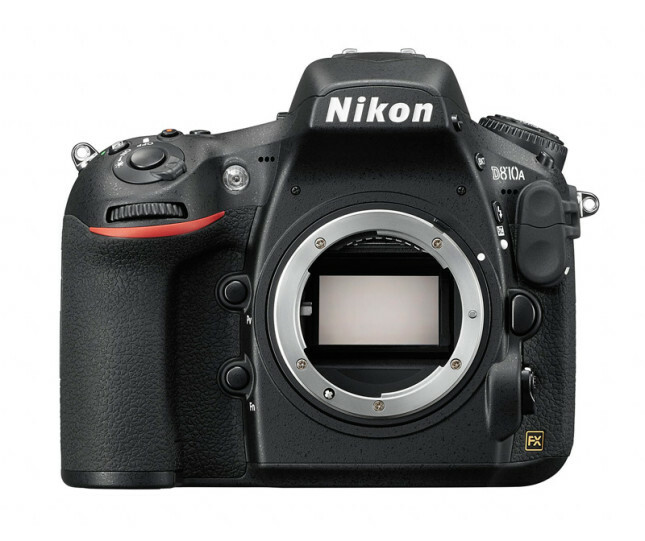 The phenomenal D810A is a specially modified version of Nikon’s high-resolution master, the D810. With a redesigned infrared (IR) cut filter, this specialised D-SLR is four times more sensitive to the H-alpha spectral line (a wavelength of approx. 656 nm). For the first time with a Nikon, the true colour of nebulae that emit on the hydrogen-alpha wavelength can be captured without the need to modify the camera. Working alongside the new filter, the camera’s ultra-high ISO, outstanding resolving power, and a host of specialised functions combine to ensure photographers can capture deep sky marvels in brilliant detail. As a modified version of the camera that boasts the most outstanding resolving power of any Nikon D-SLR, the D810A is a very special beast. Designed to deliver the ultimate in image detail, the FX-format sensor enables high-contrast 36.3-megapixel images with minimised false colour. The standard ISO range of 200­–12800 can be extended up to 51200 ISO (equivalent) and 3D noise reduction enables clean, well-defined images at high ISOs. Nikon’s fast and powerful EXPEED 4 image processor boosts the camera’s overall performance and minimises colour fringing. A truly exceptional camera, the D810A delivers results that are impossible to achieve with a regular D-SLR. The D810 is a popular camera with astrophotographers: it has the power to photograph the night sky, but a standard camera sensor is not the best way to capture images of nebulae that emit on the H-alpha wavelength. In order to prevent red colour cast, the optical filters in general D-SLRs restrict transmission of reddish light in the visible light range. In contrast, the characteristics of the D810A’s optical filter have been modified to increase the transmission of reddish light from the hydrogen-alpha spectral line by approximately four times (compared to the D810). As a result, photographers can now capture the beautiful, “true-red” colour of nebulae that emit along the H-alpha wavelength without modifying the camera. The benefits of the D810A’s modifications are apparent, even when photographing starfields and star landscapes. Equipped with a number of specialised functions, the D810A effectively counters some of the challenges astrophotographers face. Alongside Bulb and Time settings, a new Long Exposure Manual mode allows exposures of up to 900 seconds. To minimise internal vibrations during exposure, photographers can activate the camera’s electronic front-curtain shutter and reduce the risk of micro-blur in even subtle details. When shooting in Live view, a virtual exposure preview for Bulb and Time settings aids focus and framing. And, as with the D810, the Live view image can be magnified up to 23x, allowing critical focus checks to be made with absolute precision. When shooting through the viewfinder, a new red-lit virtual horizon display lets you confirm leveling. Designed to keep you shooting for long periods of time, the D810A’s energy efficient design ensures the camera will reliably capture thousands of images with long exposures. The camera’s high-capacity EN-EL15 battery can capture up to 3,860 still images1 on a single charge, and additional power sources will keep you shooting for even longer. Nikon’s optional MB-D12 Multi-Power Battery Pack works seamlessly with the camera and can capture up to 10,660 still images on a single charge.2 The sequence of battery use can be selected and set via the camera. To extend shooting time further, use the optional EH-5b AC Adapter with the EP-5B Power Connector. A great advantage of the D810A is the chance to use NIKKOR lenses. Acclaimed by astrophotography enthusiasts worldwide, NIKKOR lenses will draw out the full potential of the camera’s 36.3-megapixel sensor with ease. 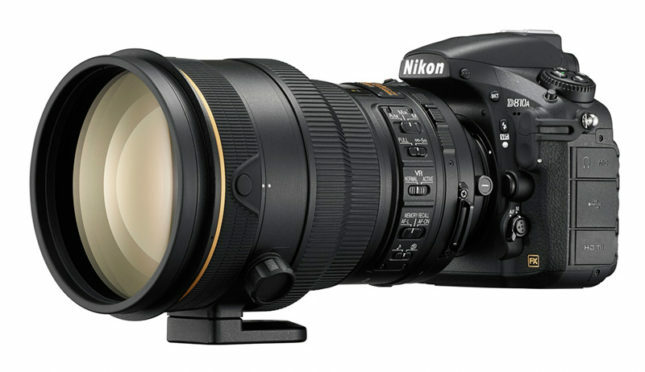 The highest calibre optics are vital for such a high-megapixel camera: from fast wide-angles like the AF-S NIKKOR 14–24mm f/2.8G ED lens, to a high-performance telephoto like the AF-S NIKKOR 200mm f/2G ED VR II lens, FX-format lenses ensure outstanding results. 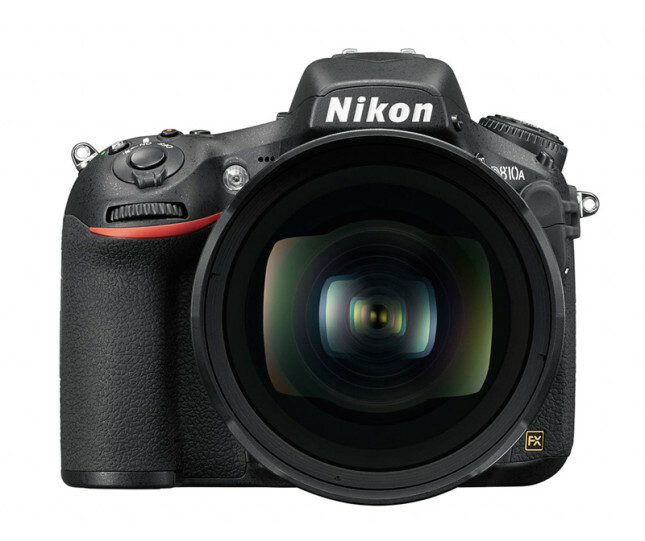 36.3-MP FX-format sensor: delivers spectacular high-contrast images with minimised false colour. Modified infrared (IR) cut filter: four times more sensitive to the H-alpha spectral line (a wavelength of approx. 656 nm) than the D810. Long exposure M mode: allows exposures of up to 900 seconds. Electronic front-curtain shutter: minimises internal vibrations during exposure for the sharpest possible results. Spectacular ISO: the standard ISO range of 200­–12800 can be extended up to 51200 ISO (equivalent). Unlimited continuous shooting: produce spectacular light-trail photography. Record as many high-quality JPEGs as your media cards and battery life allow. Live view: image can be magnified up to 23x, and boasts a virtual exposure preview for Bulb and Time settings. Red-lit virtual horizon: confirm leveling when shooting through the viewfinder. 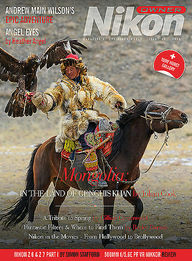 Picture Control 2.0: ease postproduction with Flat setting for maximum dynamic range; fine-adjust detail with Clarity. Multi-area D-Movie: Full HD (1080p) movies in FX- and DX-format at 50p/60p. Access the full light sensitivity range while filming, and control shutter speed, aperture, and audio levels, too. RAW Size S: delivers richly graded 12-bit uncompressed Nikon NEF files that enable faster image transfer and smoother postproduction. Fast, durable shutter: Kevlar/carbon fibre-composite shutter unit with 52 ms shutter lag, standard life cycle rating of 200,000 releases, and a shutter speed of 1/8000 to 900 s.
High-capacity EN-EL15 battery: ultra-compact and lightweight lithium-ion rechargeable battery with a capacity of 1900 mAh (7.0 V). Capture up to 3,860 still images1 on a single charge. 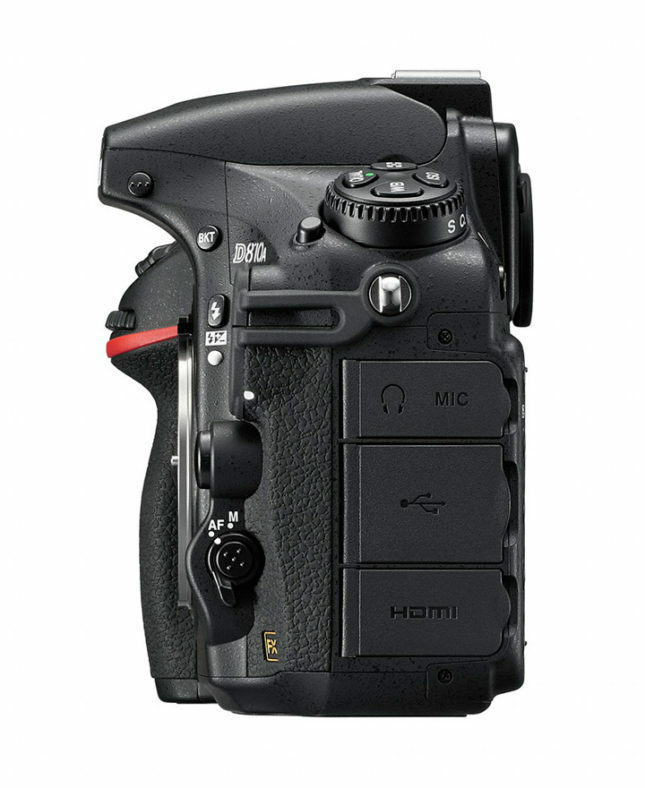 Durable magnesium alloy body: extensive weather and dust sealing ensure the D810A is moisture and dust resistant. Optional accessories: extend shooting time with the MB-D12 Multi-Power Battery Pack, or the EH-5b AC Adapter with the EP-5B Power Connector. 1 Based on Nikon tests where the built-in flash was not used, and images were not played back. According to CIPA standards, approximately 1,200 images can be captured on a single charge with the built-in flash fired for half of the exposures. 2 Based on Nikon tests without using a built-in flash. Based on CIPA standards, approx. 3,270 images are captured with a built-in flash fired for half of exposures.